Dante will go home with correct and versatile socialization to the world around him and will make an easy transition into your home to become a wonderful forever companion. He started early neurological stimulation at 4 days old until leaving our home. 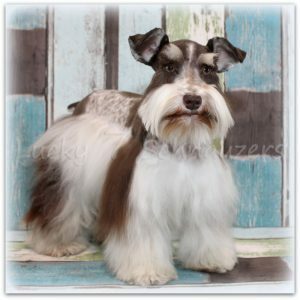 Don’t hesitate to welcome this fabulous Miniature Schnauzer puppy into your life, you won’t regret it! We estimate he will mature between 6 and 9 lbs. Don’t miss your chance to welcome this sweet, energetic mini schnauzer puppy into your home this month. 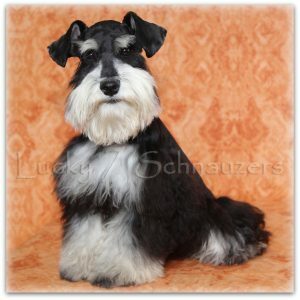 Our mini schnauzers are purchased quickly, so be sure to place your deposit today! Dante will go home crate trained and will start his leash training. He’s been microchipped, and is current on all vaccinations and dewormings. He will come home with his favorite rope toy, a crate, one pound of dog food, a comb, a toothbrush, shampoo, a treat, an information packet, a printed potty training schedule, and a 10-year health guarantee.